Today there’s no literary term to discuss. I just want to use this blog post to celebrate one of my favorite horror movie actors of all time. He wasn’t the best actor to ever hit the silver screen, but what he did for the genre was pretty important in keeping it going during times when it wasn’t so popular. He also gave us a few of the most iconic cinema monster of all time. Of course I’m talking about the amazing and wonderful William Henry Pratt… oh…I’m sorry…you may know him better by his stage name…Boris Karloff! Born in London, England in 1887. It was an interesting year. That same year saw The Daws Act which gave the president of the U.S. the right to survey Native American lands and divide them up in allotments. Over 2,000 people died in an earthquake that shook the French Riviera. It was the same year a teacher began teaching her pupil…Anne Sullivan and Helen Keller. In England, it was the year of both the Golden Jubilee of Queen Victoria and Bloody Sunday. It was also the year of the first published Sherlock Holmes novel A Study in Scarlet. Not a bad year to be born in. Even though today’s movie is the 1932 classic The Mummy (one that crept me out as a child), Karloff will forever be remembered as the definitive Frankenstein’s Monster. 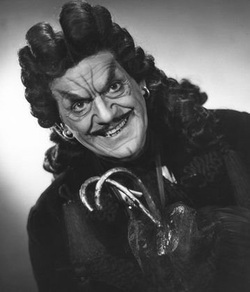 He played the monster in many films and appeared as the Monster on far too many TV shows. My favorite has to be his 1958 film Frankenstein-1970, where he actually gets to play a Frankenstein…the great, great grandson of the original Victor. 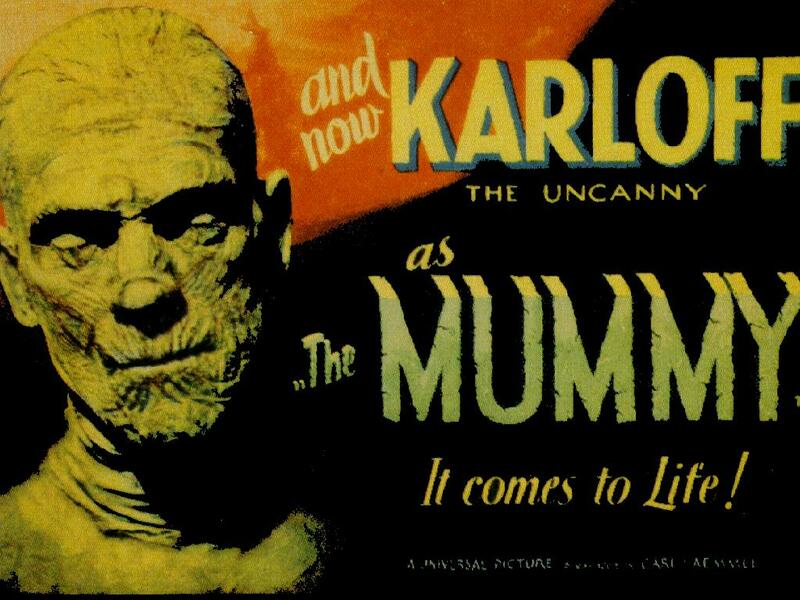 What’s even better is that it’s a film about a company making a film about the Frankenstein monster and they pay Boris Karloff’s character money to film in his laboratory, but unbeknownst to the film crew…Karloff needs the money to finish his own attempt at creating life. I guess it’s something genetic with this family! There are lots of scenes where it’s just Karloff ranting and raving doing all kinds of strange monologues, but he’s such an amazing, believable actor that it transcends the cliché dialogue and becomes something of an informed self-parody. 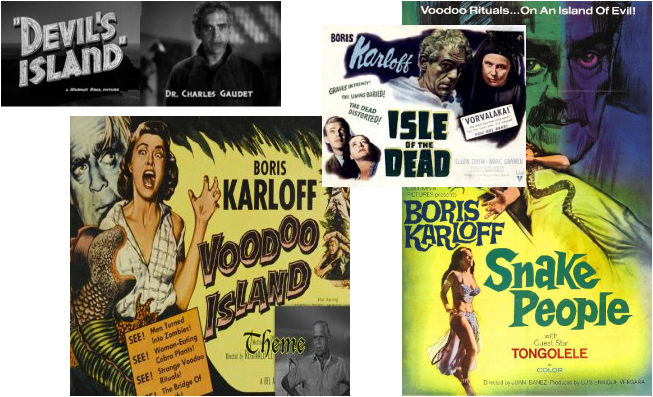 One thing movie goers should have learned without fail was NEVER go to an island with Boris Karloff as he appeared in Devil’s Island (1939), The Island of the Dead (1945), Voodoo Island (1957) and The Island of the Snake People (1971), though he had already died in 1969. 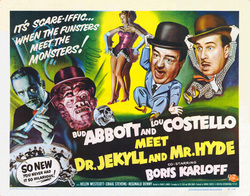 He played Frankenstein in 1931, The Mummy in 1932, and Dr. Jekyll and Mr. Hyde in 1957 where he face the formidable Abbot and Costello. He was The Man They Could Not Hang in 1939 and The Man with Nine Lives in 1940…the same year he was Doomed to Die. In 1942 he found out The Boogie Man will Get You, and in 1952 The Black Castle surely wasn’t a pleasant place to hang out. He walked Corridors of Blood in 1958 and the House of Evil in 1968. His career found new life with Roger Corman in films such as The Raven and The Black Cat. He was dealing with The Walking Dead way back in 1936! I think my favorite movie title of his work has to be The Ghost in the Invisible Bikini…seriously, that’s just awesome. Many people today don’t know that Karloff was also a popular Broadway actor and he appeared in many successful productions, particularly one of Peter Pan as...of course…Captain Hook! Thank you Mr. Karloff for all the cheesy movies you were forced to do to support yourself. Your true talent of never taking yourself too seriously in a business that’s all about image speaks volumes about your personal character. For anyone doubting that you ever did have skill as an actor and it wasn’t all just the make-up that created YOU…I guide them to what I consider one of your best performances in the 1968 film Targets. You are missed, sir. From The Man They Could Not Hang (1939) Karloff played the Dr. in this movie. Priest: It seems strange to see you in such good spirits, Doctor. Dr. Henryk Savaard: Strange that I should have no fear of dying? Well, I have lived so long questioning the unknown that this plunge into its depths is only the last and perhaps the greatest of my experiments. Priest: Have you no faith? Dr. Henryk Savaard: As a scientist, I'm afraid I'm a professional skeptic who doubts everything - even the certainties. Priest: But do you not recognize the great truths? Dr. Henryk Savaard: I never found one that would bear analysis. Priest: Can't you conceive of a truth too great for the human mind to analyze? Dr. Henryk Savaard: Tonight, no, but tomorrow I may know better! Amazing contributions to the genre.